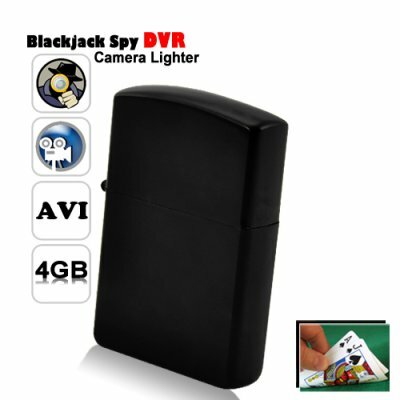 Successfully Added Blackjack DVR Camera Lighter to your Shopping Cart. Presented in a classic all metallic black finish. This DVR camera lighter is exactly what you need sitting next to you at your next card game. The Black Jack style hidden video camera comes with an included 4GB TF card, and is embedded with a micro lens that lets you capture secret footage that no one will ever know anything about! The Black Jack Camera Lighter is built with an all smooth metal body, and with a single push of the record button, you can start your ing game in complete discretion with people around you not having a clue. This is the perfect gadget that makes a great toy for yourself as well as a nice gift for any friend. The DVR Camera Lighter is simply cool and fun whether you are using it for ing or recording secret meetings so that you can be in the clear if things are taken out of context later on. Whatever the situation, this camera tool can be of great benefit to you if you work in any high pressure environment where everything that happens is vital to your career well being. This DVR Camera Lighter records both audio & video and comes with a true 1MP for a clear video recording. After you've recorded your footage, simply connect this DVR camera lighter to your computer using the included USB cable, and instantly access the DVR camera lighters 4GB micro SD card to play back the recorded computer friendly AVI footage.